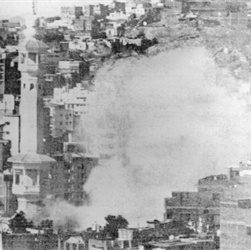 “On this day in 1979, during the annual Hajj pilgrimage, Islamic dissidents led a brazen armed attack on the Grand Mosque in Mecca, one of Islam’s holiest sites. The siege lasted two weeks, took hundreds of lives, and shocked the Muslim world. In all, there were close to 500 militants led by two men, Juhayman al-Oteibi, a fundamentalist preacher and former member of the Saudi National Guard, and Mohammed Abdullah al-Qahtani, who claimed to be the mahdi, or messiah. The men and their militant followers were launching a revolt against the Saudi monarchy, who they said had forsaken its Islamic principles and sold out to western countries. The men had prepared this assault for months and had stashed numerous weapons in a labyrinth of underground chambers beneath the mosque. The militants took hundreds of pilgrims hostage and retreated to the underground chambers, where a bloodbath ensued. Saudi authorities tried a number of tactics to fight the insurgents, including gassing the chambers, drilling holes through the courtyard and dropping grenades inside, and picking off militants with sniper fire. Finally, after more than two weeks of bloody resistance, with many of their comrades dead, the surviving militants surrendered. About 117 militants and 127 pilgrims and Saudi security were killed, with another 451 people wounded. Spurred by rumours that America was behind the siege, anti-American riots erupted in Muslim countries across the world. Perhaps most interesting were theories that the bin Laden family was behind the siege. The wealthy family, to whom Osama bin Laden belonged, were contracted to carry out the Grand Mosque renovation. Although most experts agree it is unlikely the bin Ladens were involved in planning the attack, it is possible that Osama bin Laden, who was in his 20s at the time, was inspired by the militants. Caption: Smoke rises during the Siege of the Grand Mosque, in Mecca, one of Islam’s holiest cities.